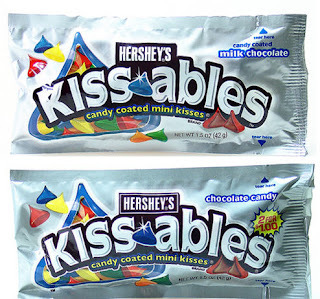 Hershey's "Kissables" No Longer Legally Considered "Milk Chocolate"
The Candy Blog noticed that Hershey's "Kissables" have been reformulated, and can no longer be legally labeled "milk chocolate" because of FDA regulations. The new package looks the same, except for the ingredients and the label which now says "Chocolate Candy" instead "Candy Coated Milk Chocolate." The new version is called Chocolate Candy which is code for chocolate-flavored confection, or candy that contains chocolate but can’t be called chocolate because it has other stuff in it that’s not permitted by the FDA definitions (like more oil than actual chocolate). The ingredients: Sugar, vegetable oil (palm, shea, sunflower and/or safflower oil), chocolate, nonfat milk, whey, cocoa butter, milk fat, gum arabic, soy lecithin, artificial colors (red 40, yellow 5, blue 2, blue 1, yellow 6), corn syrup, resinous glaze, salt, carnauba wax, pgpr and vanillin. Milk chocolate (sugar, cocoa butter, chocolate, nonfat milk, milk fat, lactose, soy lecithin, PGPR & artificial flavors), sugar, red 40, yellow 5, yellow 6, blue 1 & carnauba wax.